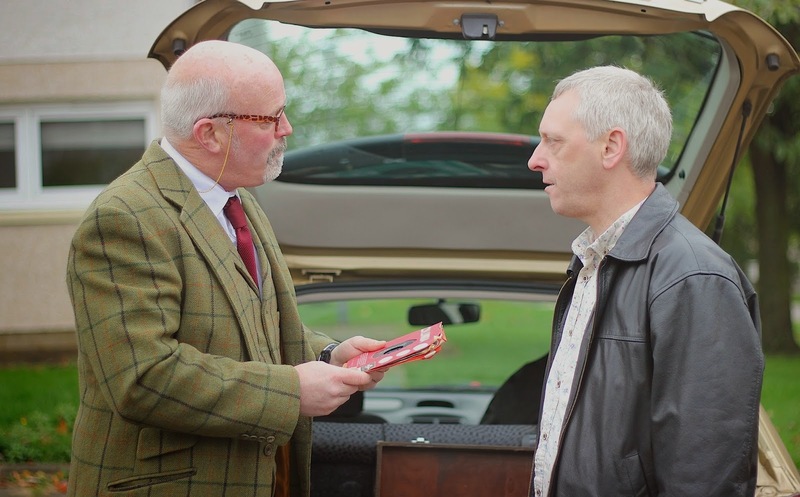 Broken Record is the story of two middle aged men who find a box of old records (LPs) during a house clearance. The men act as if they have found a bag of gold even though they have no special knowledge or interest in vinyl. The records must be valuable because they are old. Steven Patrick and John Gaffney both play their roles fairly straight and only occasionally slip into farcical performance. Andy S McEwan has made good little film here. I'm not in any way condescending to the movie when I call it a good little film. The story is small, the aesthetic is small and its nice little film. I have a feeling this is the exact film he wanted to make. This is the third Scottish short I watched this week and I noticed something really strange about all three films… they all have pay phones. This is more than likely just a cultural difference between Tucson Arizona and Glasgow Scotland but I need to ask, are there still an abundance of pay phones in Scotland? I couldn’t find a pay phone in Tucson if my life depended on it. I’m not pointing this out in a disparaging manor just a peculiar little difference. This is the first film from Andy S McEwan and he certainly shows promise. This is a strong debut. He has made entertaining film. A great number of first time directors are trying so hard to impress us that forget to entertain us. I was happy to spend 11 minutes with these characters and would gladly watch whatever this young filmmaker comes up with next. Should you watch it? Yes. Where can you watch it? Sadly the film is currently in competition and cannot be publicly shown. Andy will update me when the film is made public again and I will post a link.